Hey hey hey, your buddy Jackson is here to play, play, play! I am one happy and friendly dude that is looking for a home with real Lab Lovers. 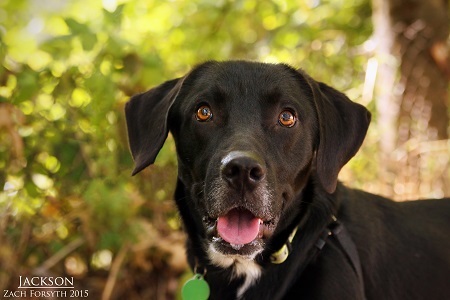 I’m a 1 1/2 year old Lab mix that is true to my breed – I am goofy, exuberant, and highly lovable. I do real well with other dogs. I’m also great with kitties AND kiddies! Hee hee! I am a country boy at heart so I need a little help with my leash manners and would do best in a home with a little bit of space (aka a yard). And maybe some cattle? Just kidding, I’m a cowboy in looks only and wouldn’t know my way around a lasso! Anyway, what d’ya say? Have room in your ranch for this guy? Fill out an adoption application so we can schedule a meet and greet. I am fixed, vaccinated, and microchipped. My adoption fee is $250.